It’s hard to believe that this coming March will already mark five long years since the death of blues piano great Joe Willie “Pinetop” Perkins. And it’s been nearly four times that long since we lost Chicago blues guitarist Jimmy Rogers. 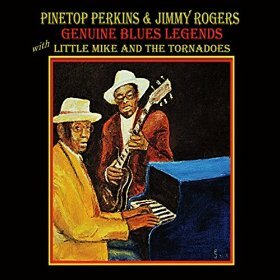 But a new CD from Little Mike & the Tornadoes provides a terrific glimpse at these two blues masters together during what may well have been their prime, from a May 1988 show recorded in Ellsworth, Maine. Although both Perkins and Rogers both at one point served as members of Muddy Waters’ band, the two never really played and toured together until the mid-1980s following Pinetop’s departure from the Waters band spin-off The Legendary Blues Band. It was at about the same time that Perkins also began playing frequently with a New York blues outfit fronted by harmonica player Michael “Little Mike” Markowitz, with all three acts coming together in the spring of 1988 for the historic performance captured here on Genuine Blues Legends (ELROB Records), the same year Markowitz produced and played on Perkins’ solo debut After Hours. The album starts off good with a lightly swinging “Kidney Stew” (Eddie “Cleanhead” Vinson) and a shuffling “High Heel Sneakers” (Tommy Tucker) that allow both Perkins and the Tornadoes to nicely show their chops, and then turns great with a superb 10-minute creeping cover of St. Louis Jimmy Oden’s “Had My Fun” (a.k.a. “Going Down Slow”) that features some stinging guitar from the Tornadoes’ Tony O Melio along with gritty harmonica from Markowitz and particularly fine tinkling of the ivories – with occasional glissando – from Perkins, who also provides vocals on the first four numbers, finishing out with Pinetop’s own lively “For You My Love” before Rogers joins in on both vocals and guitar for a trio of songs, beginning with Jimmy Reed’s “Big Boss Man”. That’s followed by two Rogers originals in the slow, bluesy, nearly nine-and-a-half minute “All in My Sleep” and the catchy, more uptempo “The Last Time”, then returning to Pinetop on vocals for the quiet piano blues of “When I Lost My Baby” featuring some wailing harp from Little Mike and T-Bone Walker-style guitar from Tony O. Things close on a much livelier – and fun – note, first with a spunky “Pinetop’s Boogie Woogie” full of “stop”, “hold yourself”, and “get it” transitions, with even a few “shake it but don’t break it”s thrown in, and next with the groove-filled instrumental “Pine and Jimmy’s Jump”. Mike and his Tornadoes do an excellent job backing – and, in return, earn lots of props from – the masters throughout the program. Recorded almost 30 years ago now, Genuine Blues Legends truly is music from another era, the type of blues they just don’t make any more. And way too great a treasure to be passed up. This entry was posted in Albums and tagged Jimmy Rogers, Little Mike & the Tornadoes, Pinetop Perkins. Bookmark the permalink.